We were recently discussing strategies to scale our business exponentially. One option was to take our flagship program to a specific target segment. We deliberated a few key questions – How many prospects will we target? At a bare minimum, how many of them will become our clients? How much revenue will we generate in the next 3 months from this target segment? Given the same investment of time, money & energy, what if we focus on the second option? Using the “5 Step Profit Acceleration Process”, we saw that we can actually make 10X more revenues (when compared to the first option). With even a small percentage of improvement across these 5 steps, we can actually generate 2X more revenues. No prizes for guessing which option we chose to pursue. As a CEO, It was a huge relief for me to have considered these questions even before we hit the market. Unfortunately, this is not the case when we talk to many business leaders. We ask them one simple question – just look at your typical day and tell us how much time was spent on goals and activities that gave only 10% returns versus the time spent on those goals/ activities that gave 10X returns. The typical answer was that 95% of the time was spent on goals/ activities that gave only 10% returns. Imagine the huge loss in revenues just because one did not focus on 10X goals! We discovered that this was not just because of poor planning. It was rather because of a poor mindset. We prefer to call this as a 10% mindset or a poverty mindset or an incremental mindset or a scarcity mindset. This mindset was formed because of one’s belief systems and sense of identity/ self-image. Belief systems and sense of identity/ self-image are predominantly shaped by the way one is raised by their parents, life experiences (good and bad) and the role model/s one tries to emulate. Belief systems act as a thermostat in a room. It always maintains the room temperature at the same level irrespective of the season (whether its summer or winter). Similarly, several business leaders’ belief systems have been pre-programmed to achieve only a certain level of success. They struggle to experience a 10X growth in their revenues, influence and impact irrespective of what they do. Unfortunately, they are totally unaware of their own self-limiting beliefs. Recently, we even saw an entrepreneur whose revenues nose-dived from 7 Million to 0.5 Million. A classic case of self-sabotage! He had not realized that a series of his decisions led to this disaster in business. Our self-limiting beliefs come in the way of taking our personal lives and business to the next level. Are we resigned to this fate forever? Can we reprogram our belief systems? Can we train someone to adopt the 10X Growth Mindset? Our answer is a resounding yes! We can change our limiting beliefs. We recently helped a struggling entrepreneur grow his business by 2X in just one coaching session. We helped him identify his limiting beliefs and adopt beliefs that empowered him. In order to grow exponentially, it’s a given that every CEO, Entrepreneur and Business Owner needs to adopt a 10X Growth Mindset. What’s often ignored is the fact that the senior leadership team and rest of the organization also need to adopt the 10X Growth Mindset. I can recollect several stories where the team was not able to keep up with the CEO/ Entrepreneur’s 10X ambitions. Such companies not only failed to scale up but rather lost all the traction they gained in the market. Even as we speak many are dying a slow death. The biggest tragedy… they are not even aware that they are dying. ₹ 13 Million to ₹ 25 Billion in a year’s time… It’s time to pull up your socks and think 10X today. Thinking 10X is no longer an option, it is the key to survival and growth. Both now and in the future! 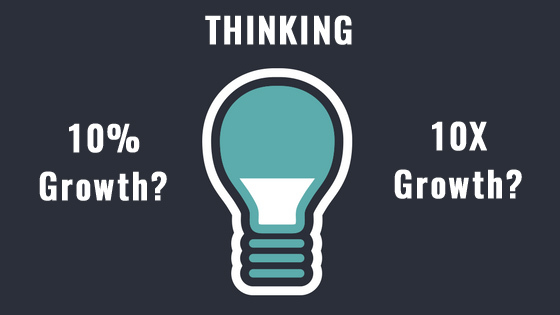 Are you and your team thinking 10% Growth or 10X Growth? Are you sabotaging your business growth? At the Business Growth Intensive, you will discover how you might be sabotaging your business growth and what you need to do differently.